The YMCA Guides program focuses on strengthening the father-child relationship through activities that allow fathers to spend quality one-on-one time with their children. Back in November, we hosted a cleanup event for members of the YMCA Guides-Princess program which is for dads and their little girls (see earlier Blog). 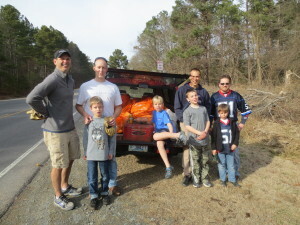 Members of the complementary program for dads and their boys, the 'Little Braves', came to the lake on Feb. 2 for a trash cleanup of a wooded area and shoreline on the east side of the Farrington Pt. bridge, opposite from the entry to the Wildlife Resources Commission Boat Ramps. In less than 1 1/2 hours, four dads and four Little Braves hauled out 9 very full bags of trash. They also found tangles of fishing line and a five-gallon gasoline tank (see photo) that must somehow have detached from an outboard motor. The tank was full of gasoline. The boys were amazed at all the trash strewn through the woods. Maybe they will tell their friends about why littering is harmful.